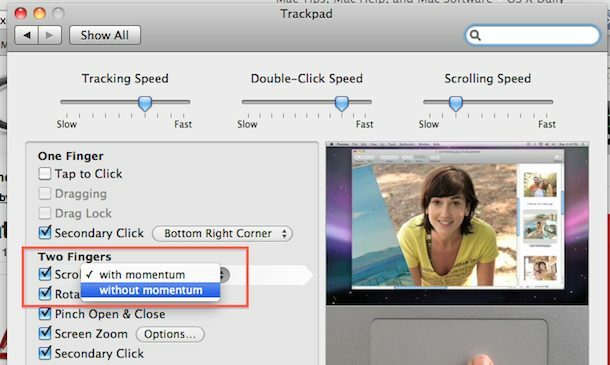 Scrolling with momentum is a feature that is included with some MacBook Pro trackpads (and MacBooks thanks to a recent software update from Apple). The behavior is very much like the iPad or iPhone, when you are scrolling through anything you can give the trackpad a swipe and the speed of your gesture will determine the length of the scroll. I like this feature and keep it enabled on my MacBook Pro, but some people are bothered by it. Changes will take effect immediately. You can enable the momentum scrolling by simply reversing the setting to ‘with momentum’ and your setting will be back to the default. Some people call this feature ‘intertia scrolling’ or ‘inertial scrolling’ but Apple calls it ‘scrolling with momentum’ within the System Preferences, making it the proper description. On my preferences pane it says with and without inertia, so thats why some people may be calling it that way, anyway good tip! I did not like it when it started doing that. I just got the magic trackpad and found that the inertia option caused rough scrolling in certain applications. (i.e. MacVim) Since I am a developer, I use MacVim nearly every day and it was a big find to figure out that the scrolling works much better with inertia turned off. « Apple working on “revolutionary” Mac OS X 10.7 feature – is it Cloud computing?